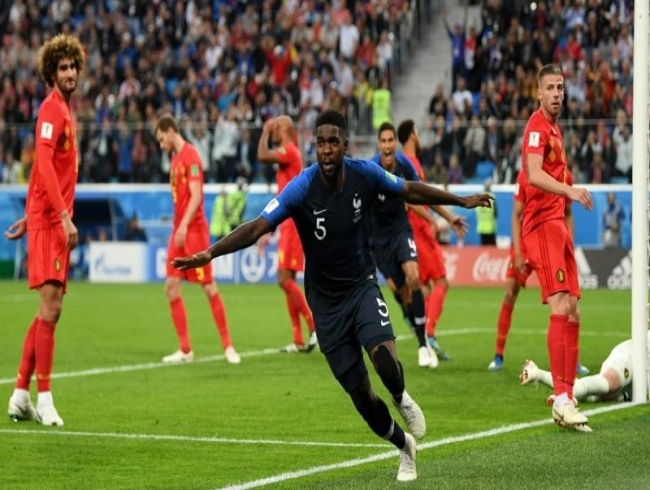 SAINT PETERSBURG: Samuel Umtiti headed France into the World Cup final in Saint Petersburg on Tuesday with a 1-0 win, consigning Belgium's 'golden generation' to another bitter disappointment. France's own supremely talented young squad will aim to make amends for defeat on home soil in the final of Euro 2016 in Sunday's showpiece against England or Croatia. Belgium's Kevin De Bruyne warned Kylian Mbappe was ready to take the world by storm on the eve of the game and the most expensive teenager in the history of football showed why inside the first 60 seconds. He skipped past Jan Vertonghen with ease and only a last-ditch tackle by Vincent Kompany prevented Griezmann from latching onto his cross. For the generation of Hazard, De Bruyne and Romelu Lukaku, beating Brazil in the quarter-finals was meant to be the breakthrough on route to winning a major tournament. Instead, it proved to be another false dawn as France march on to Moscow.